It's been a while since I've posted; but time spent on the computer is time spent away from the studio and creating. During the past few weeks, I've been blessed with a creative "rush" from my Muse, so I locked myself into my little studio and covered myself in paint and gesso! Unfortunately, there was a small "sacrifice" -- in a rush of creative enthusiasm, I ruined a brand new pair of beautiful gray ponte knit pants! 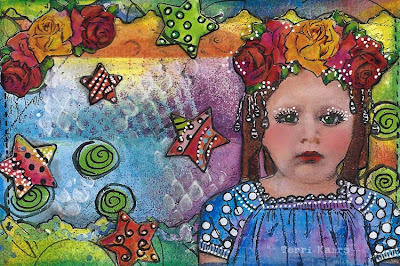 My creative "rush" began with inspiration from Ro Bruhn's "Flower Power" class in the "21 Secrets" Workshop. 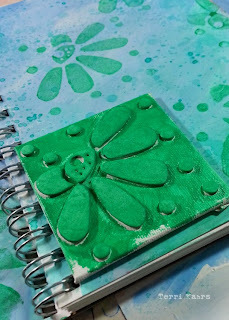 Ro's flower stamp tutorial and my penchant for "color" married beautifully! Since Ro's flowers are so organic and wonderful, rather than use a digital or printed image, I decided to try my hand at sketching. 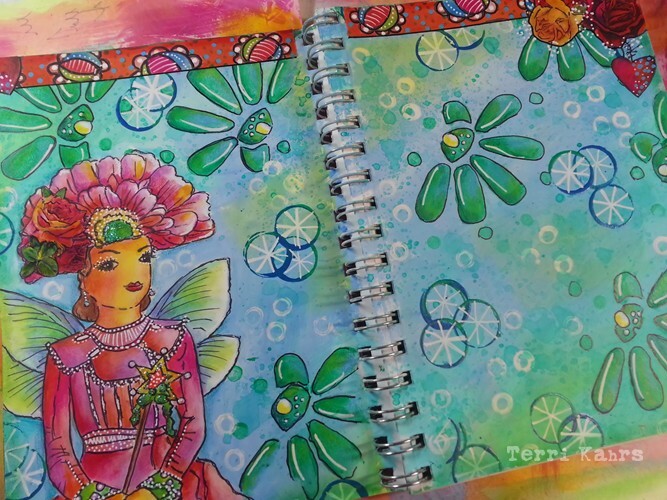 This spread began with a gessod and colored background (I show how to create it in my "21 Secrets" class), a pencil sketch, followed by a black Pitt pen (because it's waterproof when dry) and finally . . . . color . . . LOTS of color! Layers and layers of color were added to the background and flowers, along with doodles, highlights and my signature roses and little white dots. Who knew that one small idea could ignite such a HUGE burst of creativity!?!?!? On a quick note: I haven't been posting here too often, and I know you're curious to see what I've been up to. If you'd like to see what I'm working on or doing on a regular basis, please check into Facebook, Instagram or Twitter. I promise to "keep it interesting" and always "colorful"!!! 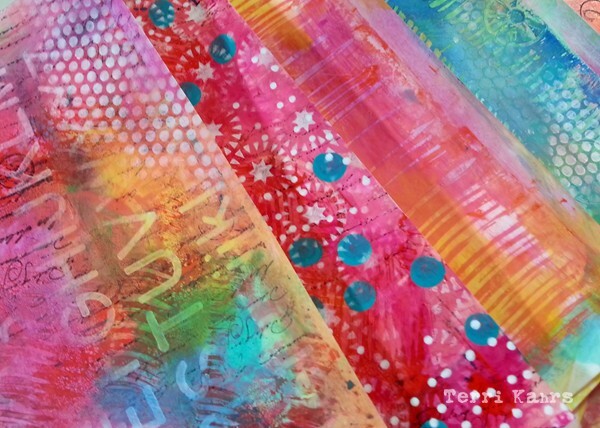 May your day be sparked with "creative enthusiasm"!!! PS There's still plenty of time to register for "21 Secrets". 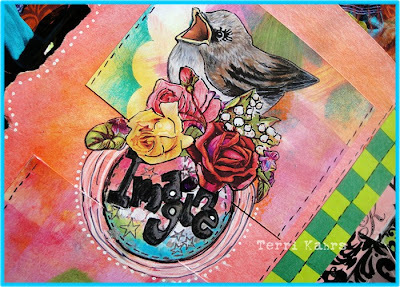 Click here or on the "21 Secrets" button on my sidebar to learn more about this art journaling learning experience! 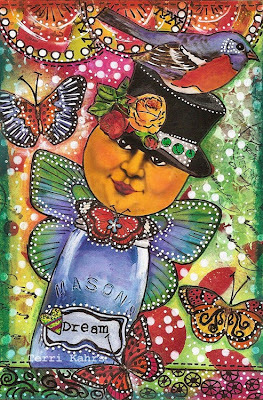 "Sunday Postcard Art" is a weekly challenge that's near and dear to my heart for many reasons. When Mandy asked if I'd like to host this week's challenge, I was honored to say "Yes!" This week's subject is "Soar"! If you'd like to play, it's very simple: Create a postcard and post it on the "Sunday Postcard Art" site! 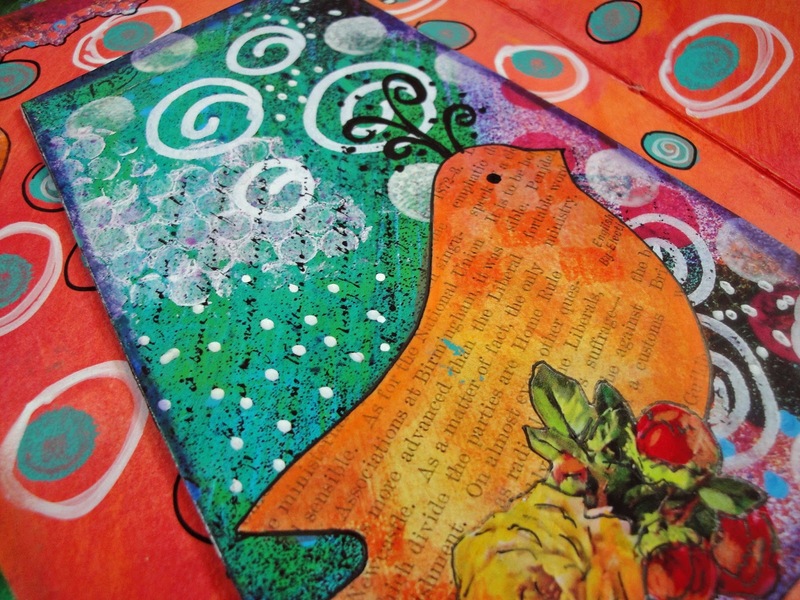 The art is terrific, Mandy and Donna are awesome, and you might even make a few new friends!!! May you spread your creative wings and "Soar"! 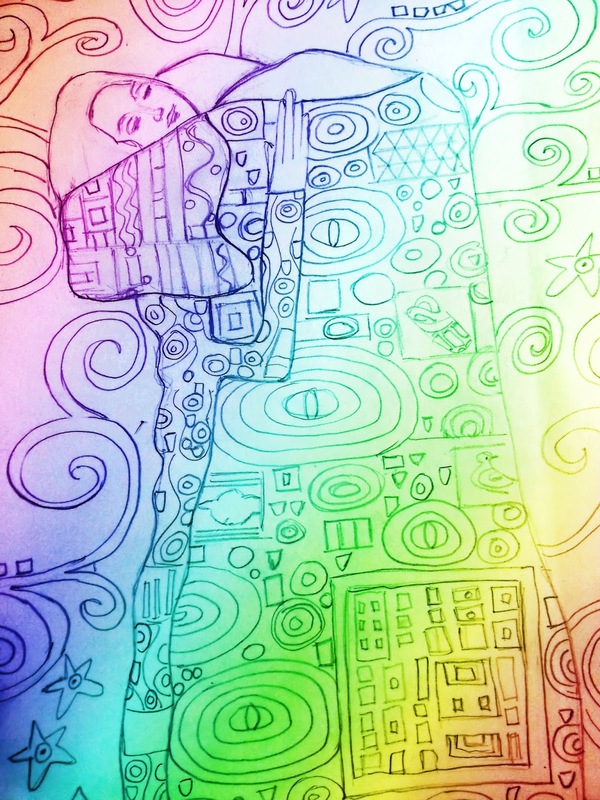 It seems as though it's been ages since I've spent an afternoon dedicated to pure creative freedom and experimentation. 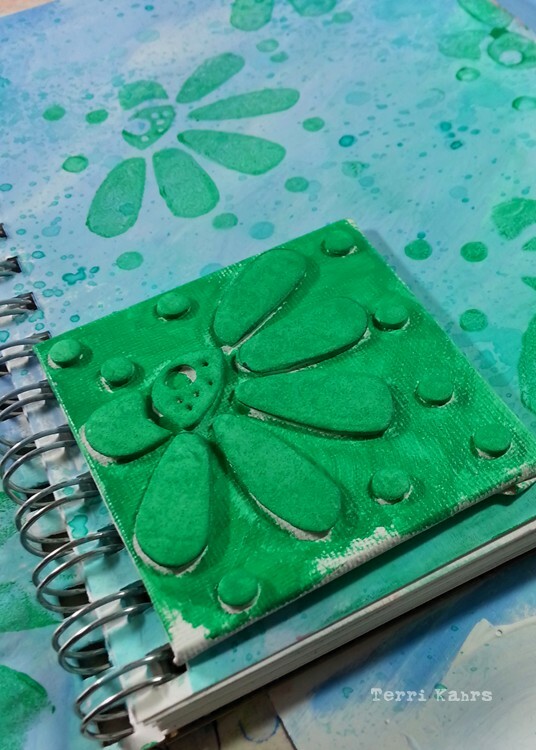 A few months ago - after hearing terrific reviews from other artists - I decided to purchase a Gelli Plate, and it's been waiting patiently for me to find some dedicated "play time". Earlier this week, I pulled out my new toy along with a variety of acrylic paints and an assortment of tools. I didn't worry or wonder about what I was creating. I consciously decided to live in the moment and played to my heart's content. 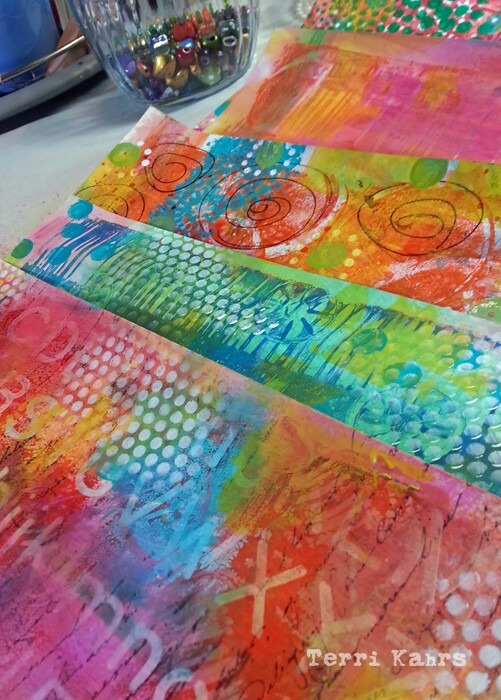 The initial base of color was applied to the Gelli Plate, and that first layer was allowed to dry well before more luscious texture, pattern and colors were added. When I began my studio session, I wasn't quite sure of what to expect and I had no inkling of anticipated results - I consciously played!!! In my opinion the results speak for themselves, and I couldn't be happier with my purchase!!! May you find the courage to play! The "21 Secrets" Workshop is officially "open", and I've been dashing in and out of my virtual classroom over the past few days. My students are awesome, and the entire workshop experience is amazing! Personally, I can't wait to dive headlong into a few classes myself! The dilemma is: Which class should I choose first? It's very much like being a child surrounded by a heap of beautifully wrapped presents!!! I recently updated my blog banner (and Facebook header), and thought you might like to see the entire piece. My creative process for this 4"x6" page began with a copy of a previously created background and one of my favorite images. Why use a previously created background? Frankly, it saves "creative" time and often jump starts a project. To make this an "original", I added watercolors, Prismacolor pencils, markers and acrylic paints. There's still plenty of time to register for "21 Secrets". 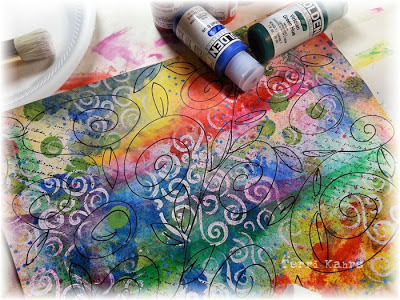 Click here or on the "21 Secrets" button on my sidebar to learn more about this fabulous workshop! May your day be filled with Springtime delights! After months and months of anticipation and preparation, all of the "21 Secrets Workshop" classrooms are open today! I'm soooooo excited! I've already met some of my students and am looking forward to working with old and new friends in my "I Have A Secret" class! There's still plenty of time to join the fun. All 21 classrooms will remain open through January, 2014 with access to everything - 24/7. It's an amazing assembly of instructors and talent. 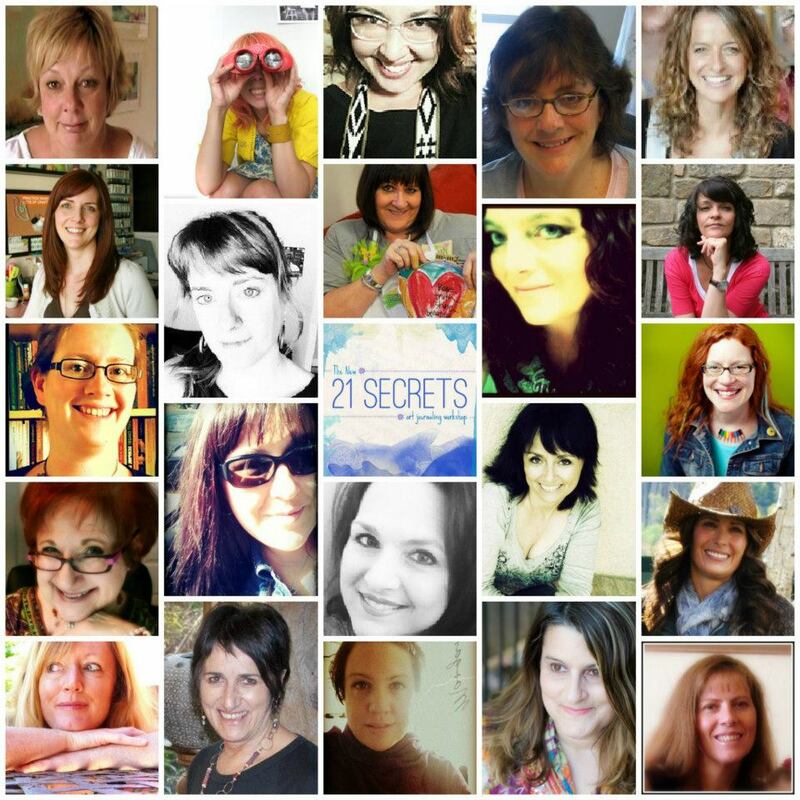 You can register at any time by clicking on my "21 Secrets" sidebar button. I hope to see you in my classroom soon! May your day be filled with creative opportunities! My heartfelt and sincere "thanks" to everyone who entered into my giveaway for the free seat in this year's "21 Secrets" workshop! Wow! The response was overwhelming and wonderful! It's a little blurry . . . but it's #22! There could only be one winner (How I wish there could've been more!) . . . . but there's still plenty of time to sign up for this year's "21 Secrets Workshop". 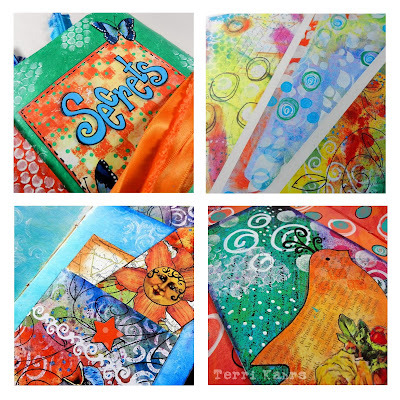 If you're interested in taking your art journaling to new levels, click here or on the "21 Secrets" button below to learn more and/or register. Our "virtual classroom" doors will open on April 1st and will remain open until next January, 2014. Remember . . . . there are 21 teachers and 21 different "lessons". When you register, you'll have complete access to everything 24/7. Amazing! Personally, I can't wait for class to "begin" and hope to see you there! May your day be filled with creative "wonders"! 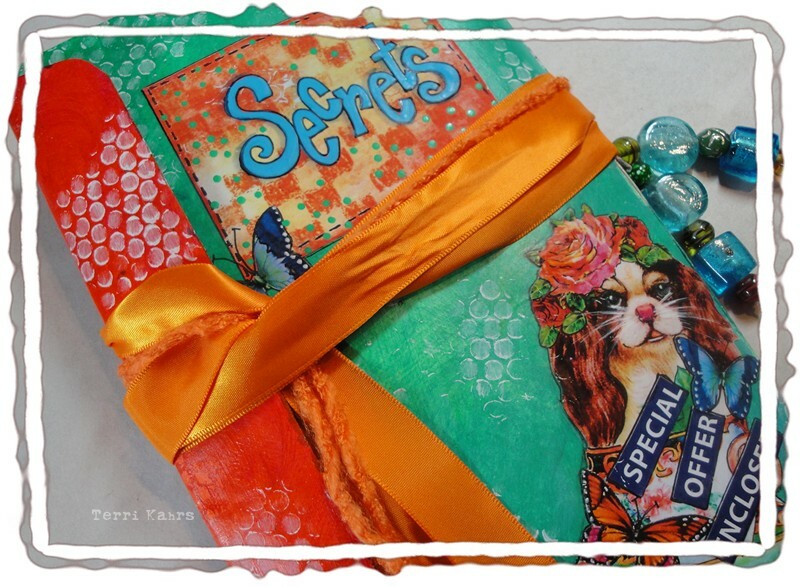 Last Friday, Connie Hozvicka from Dirty Footprints Studio, posted this journal page along with a description of the "I Have a Secret" class that I'll be teaching in this year's "21 Secrets" Workshop. Many of you know how difficult this past year has been for my husband and my family. It's been a year of great fear and sorrow; however, there have been many reasons for gratitude and joy. When Connie requested a "special piece" to promote my workshop, many of the lessons I learned over this past year came to mind. Color that hadn't been expressed in months, poured from my heart. 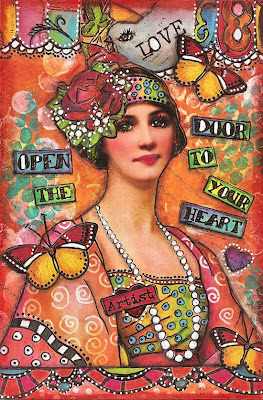 This page expresses the one largest lessons - I've learned to "Open My Heart" to allow love and Light, and I've learned to "believe"! Miracles CAN & DO happen! And. by the way . . . . Art Heals! Don't forget . 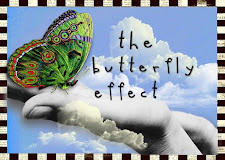 . . . . because of Connie's generosity, I'm giving away a free seat in this year's "21 Secrets' Workshop" (A $59 value!) to one lucky winner. There's still time to enter by clicking HERE. Your entry must be a comment that's posted on the previous blog post! Entering this giveaway is super easy! Just leave a comment on the previous post only by Saturday, March 23. The winner will be chosen by Random Org and will be announced on Monday, March 25. Everyone is welcome to enter! Make a wish and enter! May your heart be filled with gratitude! Secrets & A BIG Giveaway! When Connie Hozvicka from Dirty Footprints Studio invited me to teach a class in her awesome "21 Secrets" 2013 Art Journaling Workshop, I was honored and thrilled. I think you'll be as awestruck as I am over this year's teaching staff!!! It's an amazing line-up of talent! You can click here to go to the workshop's website. There's a big reason why I haven't posted recently. Over the last month I've been a busy bee working on my tutorials, filming and editing video presentations and creating handouts for my "I Have a Secret" class. To give you an idea of what I've been up to, I've created this slideshow to give you a glimpse of what you'll be learning in my virtual classroom. I'm so excited! 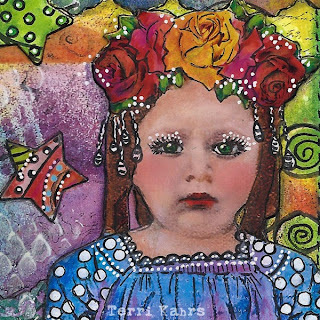 I Have A Secret - Overview from Terri Kahrs on Vimeo. I'll share many personal secrets and two of my journals, as well as some of my favorite tips and techniques. If you've wanted to know how I achieve my "look", applied my color or wondered about the thought process behind my pages, I'll answer those questions and more! And, of course, I'll always be available to answer questions and provide support. 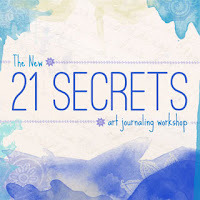 "21 Secrets" will go "live" on April 1, and for $59 you'll have complete access to all 21 class workshops and all 21 teachers for the remainder of 2013. You can pick and choose from all of the classes - take all of them or just a few - watch and learn at your convenience. Any way you look at this workshop, it's a fabulous opportunity to learn and grow! Now for the BEST part! I love surprises, and I have a terrific surprise for YOU! 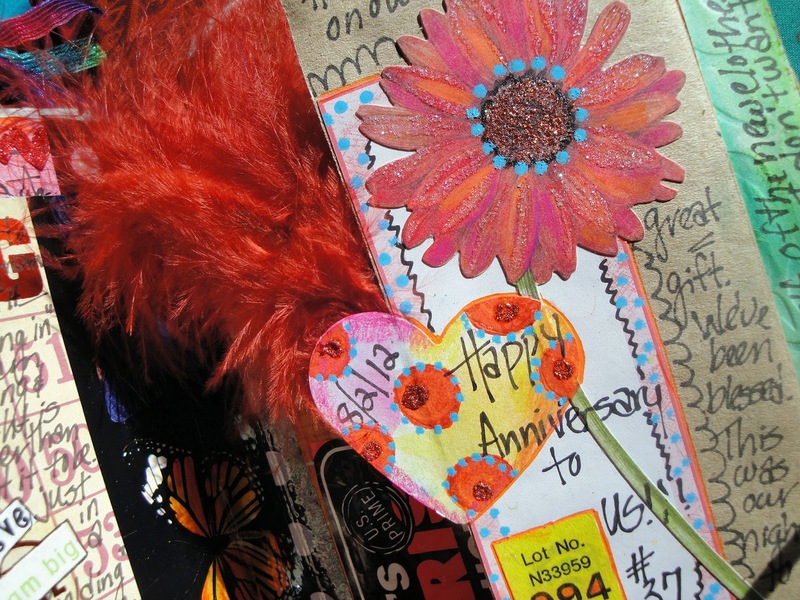 Through Connie's generosity, I'm giving away "One Free '21 Secrets' Workshop" (A $59 value!) to one lucky winner. How exciting is that?!? Entering this giveaway is super easy! Just leave a comment on this blog post only (not on Facebook or Twitter or Flickr) by Saturday, March 23. The winner will be chosen by Random Org and will be announced on Monday, March 25. That's all you have to do to enter, and everyone is welcome! There are no hidden agendas, secret passwords, and there's not a hoop in sight. 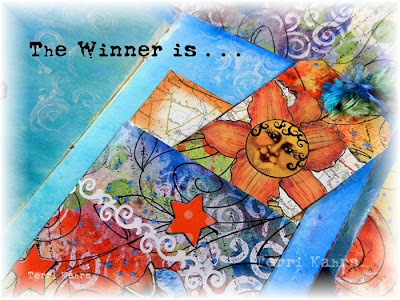 Just leave a comment here and a way that Connie and I can reach you to let you know if you're the "lucky winner"! Cross your fingers, tell a friend or two, and make a wish on a lucky star! 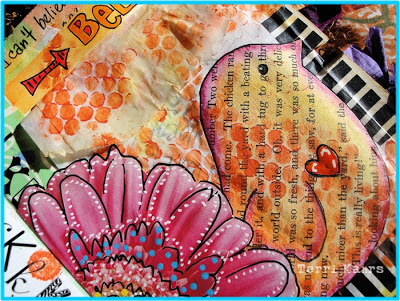 A few weeks ago, my art group was given a challenge to create an altered envelope inspired by Gustav Klimt. 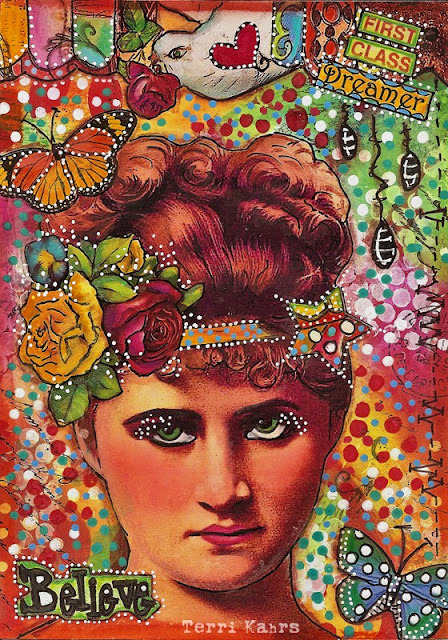 An Austrian symbolist painter, Klimt was known to be an extraordinary admirer of the female persuasion. I completed my envelope and will reveal it in a future post; however, in the process of creating my mail art, I renewed my fascination with all things "Klimt". One of Klimt's most famous paintings, "The Lovers", depicts a couple caught in an intimate embrace. Rumoured to be Klimt and one of his many "lovers", I've always been intrigued by their story. 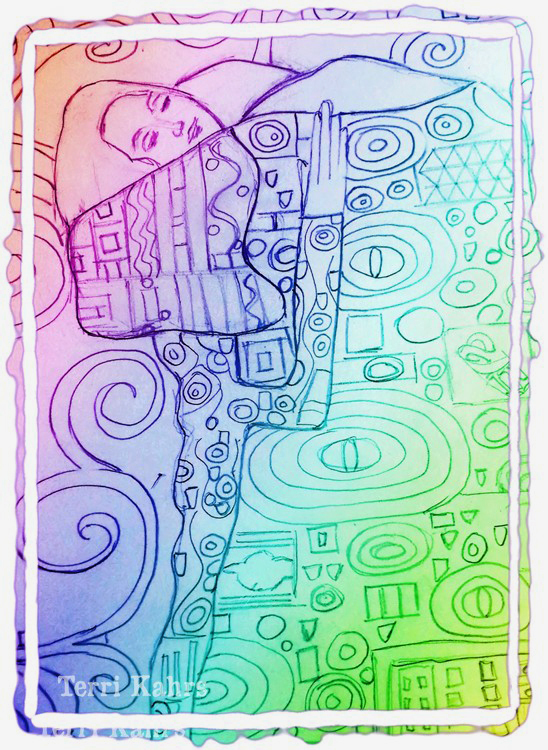 So, a few days ago I pulled out a sketchbook and allowed my Muse to play with my interpretation of another Klimt painting. 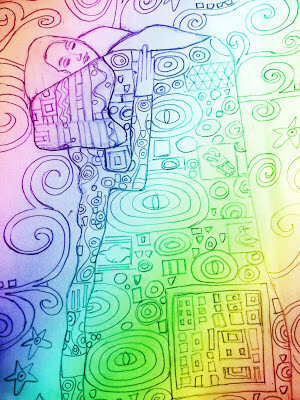 "Awwww" . . . . she murmured as my pencil flew and my imagination soared. As much as I loved my drawing, it seemed incomplete. 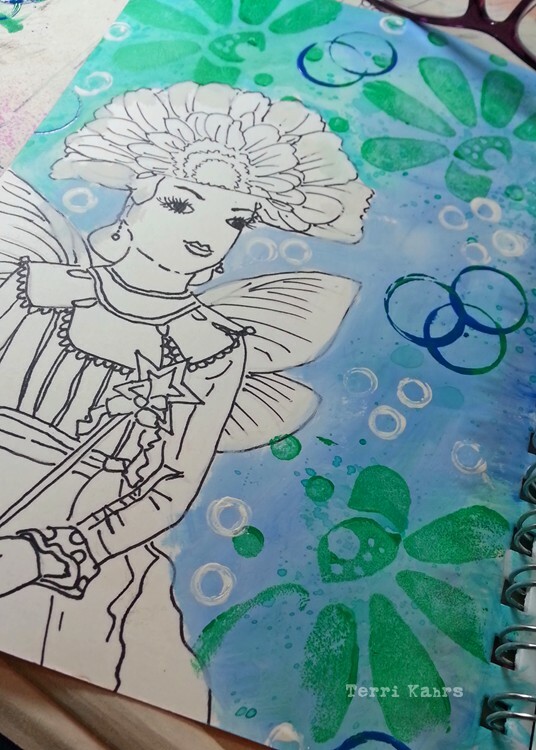 Known for his use of geometric forms and color, sadly, my drawing lacked Klimt's bold hues. Modern technology was called into play: I quickly scanned my drawing and played with "filters" in a photo editing program. "Ohhhhh! ", said My Muse, as she danced around with computer mouse in hand! "That's more like it! ", she uttered breathlessly! 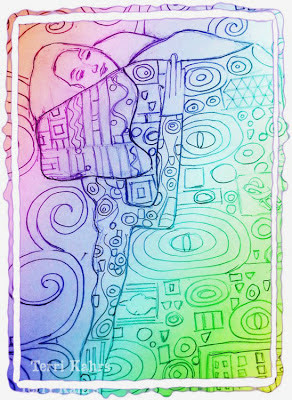 Yes, I fell in love with my "Klimt interpretation" of love! May your Valentine's Day be filled with love and creativity in many forms! With life happening at the "speed of warp" lately, I had to take a moment to remind myself to breathe! Caught up in the momentum of life, I've forgotten how to take a deep breath and appreciate "the present". A dear friend told me that I need to appreciate the space that I'm "in" today. With those words swirling through my mind, I grabbed a small piece of paper, wrote a tangible "reminder" and pinned it to the carousel on my desk. Step #1: Accomplished . . . . Step #2: Do it!!! LOL!!! May you exist in the "moment"! My Favorite . . . . The other day someone started a post in a Facebook group asking: "What art supply couldn't you live without?" What a thought provoking question! 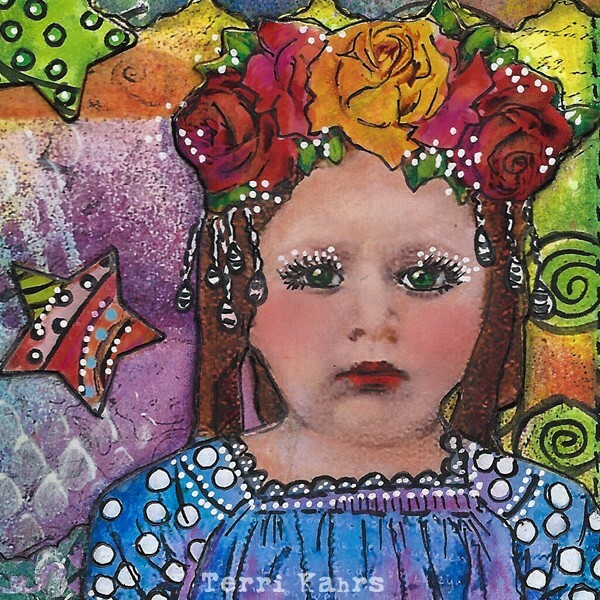 Since my work is known for it's rich, saturated color, I use many layers, techniques and media to achieve results that please me. However, my answer to that question came immediately: I couldn't live without my Derwent Inktense pencils! 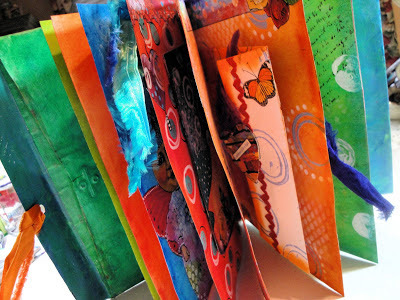 1) They can be applied "dry" or "wet"
2) They can be used on multiple surfaces: Paper, cloth, etc. 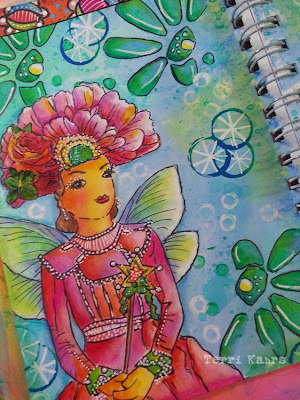 Although I considered my initial purchase to be an "art investment", my Derwent Inktense pencils were well worth the price. They last and last and always give terrific results. In essence, they're my idea of "perfection"! May your day be perfectly creative! When it comes to finding interesting color palettes that catch My Muse's wandering attention, sometimes stopping to take a look back actually helps to propel me "forward"! 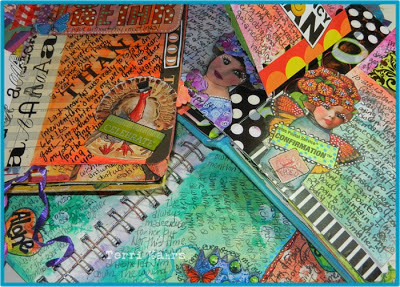 A few days ago in an attempt to lure my sleeping Muse into action, I emptied my closet of art journals long finished and filed away. 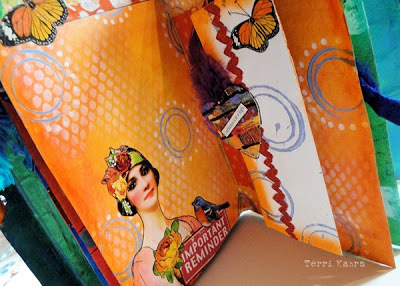 As I opened book after book, I found a few pages that I really enjoyed creating, stood back and "observed". I asked two questions: What was it that I loved about those pages? and, Why did they pique my interest? Old Journals + Color + Memories = Inspiration! As I studied the open books, details from two particular pages, caught my eye. Lovely hues of pinks and shades of oranges spilled from those pages and into the room. Suddenly My Muse smiled in delight! Of course, she whispered: "They're pretty in pink!" May your day be filled with sparks of inspiration! During the past few days, I've had an opportunity to slip into my little studio for some much-needed art time. 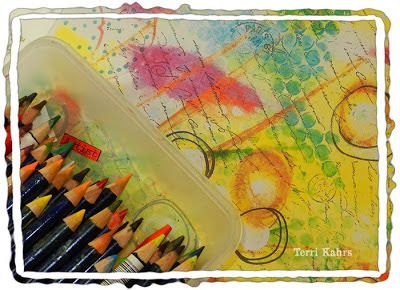 I have a confession: "My name is Terri, and I'm addicted to color!" LOL! In my humble opinion there's nothing like a good dose of highly saturated color to brighten spirits on a gray winter day. 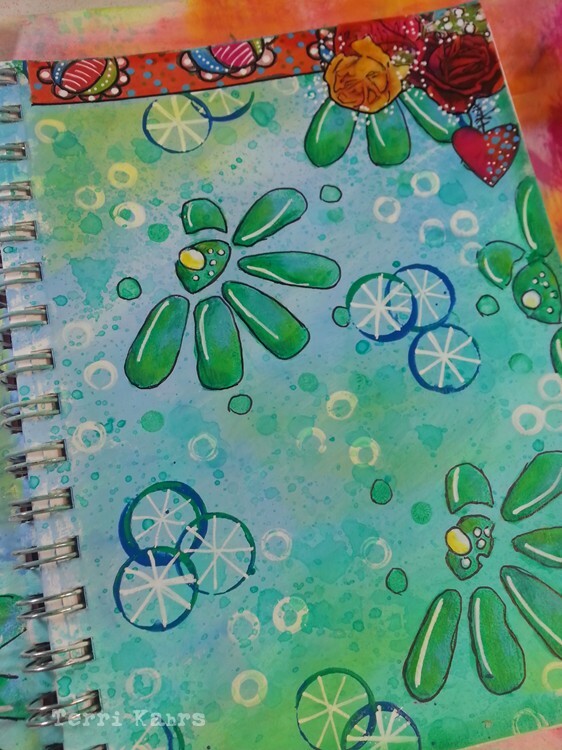 I'm preparing to shoot the videos for my "21 Secrets Art Journaling Workshop", and I've rediscovered the joy of making backgrounds - the brighter, the better! "Golden" fluid acrylics are my "color drugs of choice". Although they're a bit expensive, they're well worth the price and are a good investment. A very little color goes an extremely long way and provides wonderful, rich results every time. 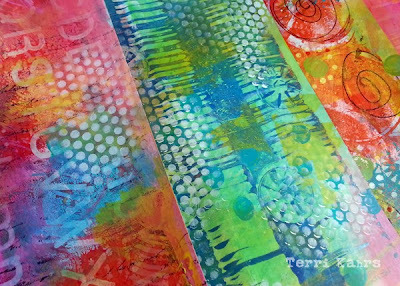 During one of my "21 Secrets Workshop" videos, I'll share a few tricks for making quick, luscious backgrounds. 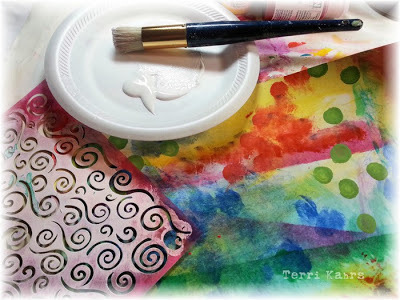 Recently, I've had a few questions regarding the workshops: Yes! There are 21 teachers participating, and they're from all over the world. Yes! You'll have access to all of the video lessons and all 21 teachers for a solid year for the $59 price! Additionally, you get to "pick and choose" your classes on your own time - watch and learn at your own pace. There's a Facebook page too for lots of support and camaraderie. 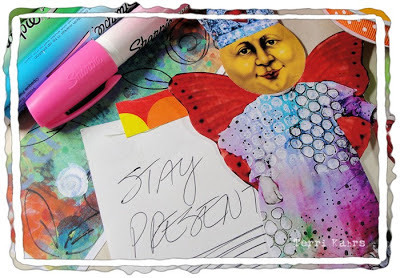 Click here or on my sidebar's workshop button, it will take you right to the "21 Secrets Workshop" website so you can learn more. All 21 teachers are listed along with the names of their respective classes. What an amazing bargain! If you register through my "links", I'll receive a little credit and would truly appreciate your support! May your day be filled with colorful fun! "21 Secrets" - An Invitation! 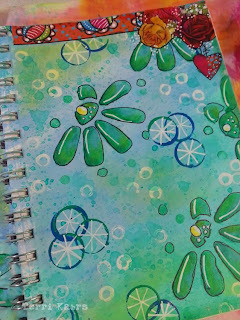 For the past few months I've had to keep lots of delicious secrets about this year's "21 Secrets" Art Journaling Workshop to myself. Today's the day we can finally shout it from the rooftops: Registration is open and all 21 teachers and classes have been announced! Whoo-Hoo! As a matter of fact, I'm so excited, I'm presenting you with a "personal invitation" to join the fun! I'm over the moon about being included in this year's teaching staff, and can't wait to share my ideas and some of my techniques. Please click here to learn more about this year's workshop, or click on the workshop button that's posted on my sidebar. Many wishes and blessings for a creative journey! It's a beautiful New Year . . . . one that's shiny and brand new. It's a New Year filled with wonderful possibilities that are laying before me like a string of lustrous pearls waiting to be worn to a fabulous party. That being said, I wanted my first piece of this wonderful year to be particularly meaningful. Last year was a year filled with countless trials, personal challenges and sacrifices. However, it was also filled with many lessons and innumerable blessings. So, as I hung my brand-new 2013 calendar, I uttered a silent prayer. My first piece of the New Year reflects my deepest thoughts: I truly believe (with all my heart) that each day of this New Year will be blessed with promise. I believe that every hour and each minute will hold a special blessing. I believe in the joy of family, and I believe that many happy memories will fill this year with the sound of laughter and the camaraderie of friends. May your New Year unfold with countless blessings and joyful moments! 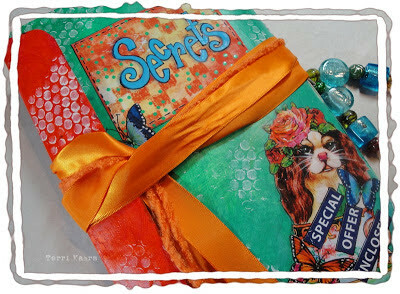 PS: The first thing that I'm looking forward to in 2013 is my opportunity to teach in the on-line Workshop "21 Secrets"! These awesome classes will go on sale later this month. Click here for more information and to sign up for the email newsletter or go to the "21 Secrets" button on my sidebar! Happy 2013! Let the fun begin!